The warring gods were angry. Lightning flashed across the sky and struck a rainbow which burst into a shower of glittering fragments that rained down upon the earth below. The myths about the origins of opals are as dramatic and romantic as engagement and wedding rings made from them. But the real story of opals should be part of your decision about choosing the gem for your wedding ring. 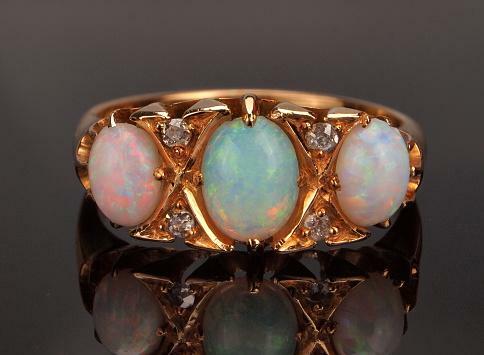 Once you consider an opal for your wedding ring, you'll encounter a mother lode of stories - some fairytales, some Gothic horror. However, opal engagement rings aren't bad luck for engagements. The name of the stone itself comes from the Greek "opallios," meaning "to see a change in color," and from the Sanskrit "upata" for "precious stone." Opals are characterized by a kaleidoscopic play of colors that make them seem like living beings or light fantasies - and give rise to numerous legends. Arabic tales tell of those lightning bolts fracturing slivers of light out of the sky. 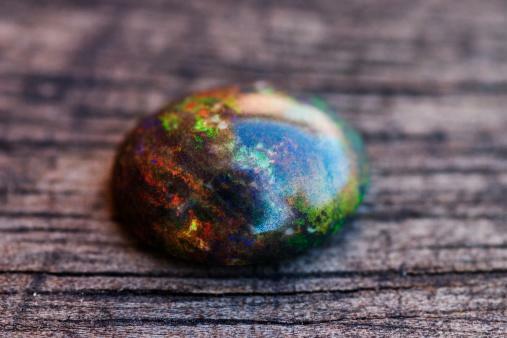 Australian opal myths are steeped in rainbows. Pliny, the first-century Roman scholar, likened opals to active volcanoes. Medieval fabulists assigned the energies associated with colored gems to the winking colors of opals - the stones held every kind of luck and power within their shifting hues. Rulers wore opals in their crowns to protect against evil and preserve eyesight. Ground-up opal dust was eaten to banish nightmares. Opals were considered so supernatural, and so desirable, that Sir Walter Scott used one as a plot device in a 19th-century novel, with unfortunate results. In his book, holy water was sprinkled on a particularly powerful opal, extinguishing its light. The fictional wearer promptly died - and opals never managed to shake off the bad press. But the rare beauty of the opal weaves its own magical spell, and the increasing scarcity of high quality opals today has restored them to a prominent place on a gem-collector's wish list, and also made them a prime choice for a unique engagement ring. There is a simple chemical reason why an opal behaves like no other gemstone. It's a non-crystalline mineraloid made up of quartz and water. If you could peer into that winking opal, that looks like a perfect fit for your hand, here's what you would see: microscopic spheres ribboned with chains of silicon and oxygen, holding anywhere from five percent to 10 percent water. Opals are chemically described as SiO2 - nH2O - hydrated silicon dioxide. That's quartz with a discernible water content. 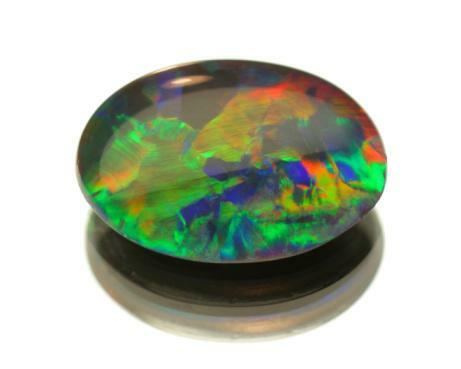 When the spheres within the opal are struck by light, they diffract the light into prisms. It appears like it is magic. But 'magic' that comes at a price. That exquisite diffraction means opals are more prone to scratching and shattering than some of the harder gemstones, such as diamonds. The opal you set into that gold or platinum band is a complex mix of factors that require knowledge and nurture. To prevent crazing or cracking, avoid exposing your opal engagement ring to extreme heat or dryness, sudden temperature fluctuations, or bright lights. Don't leave or store an opal in direct sunlight. That could "dehydrate" your stone. But do clean it gently with warm, soapy water to safely restore its brilliance. The stones are classified by their background colors. Black shows off the rainbow play of colors to best effect. Translucent is a more ethereal display of shifting hues. Milky is most common and mutes the colors in the stone but can be extraordinary, depending on which shades predominate and whether your stone has pinpoints or patches of color. Play-of-color - vivid, large swaths of many colors to tiny glints of one or two colors, determines the desirability of a stone. The type you chose for your engagement or wedding ring will depend on your personal preference and style. A really rare stone will be left as pristine as possible, often in an irregular shape, to preserve the play of colors. Those are set pieces, not everyday rings. For an engagement or wedding ring, you'll probably want a cut and polished "boulder" stone. An oval cabochon allows the colors to show from a variety of angles. A solid cabochon opal (a one-piece or boulder stone) is tough enough to wear all the time - the expense of a good quality stone and a topnotch jeweler is insurance that your enchanting opal won't be too fragile to enjoy. There are less expensive options that can be lovely and put an opal ring within reach. Those need more delicate handling than a solid stone. Doublets are thin slices of opal -- often very beautiful and prismatic pieces - backed by a hard, non-gem stone such as obsidian, or even black glass. A triplet is an opal with an opaque backing for strength and a clear crystal or glass top layer for protection. Doublets and triplets allow you to enjoy the unique qualities of an opal but the trade-off is that you do sacrifice value and potential longevity. 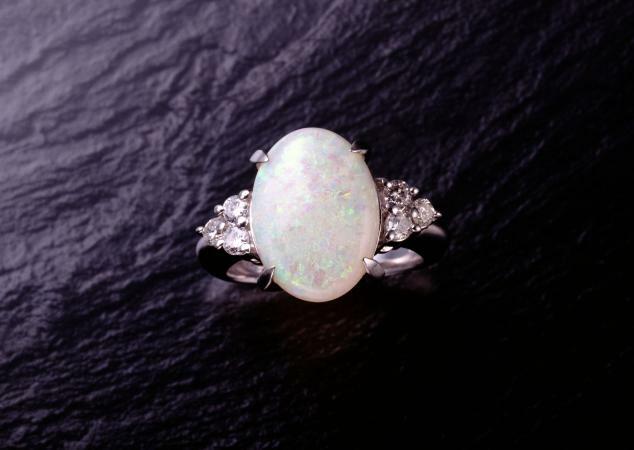 Opals are the October birthstone and have always been considered lucky for anyone born in that month. But the stories surrounding the glinting stones have wrapped them in a mystique that may fascinate you enough to take the plunge and use opal for your engagement ring, no matter when you were born. Opals have been credited with extending natural hair color and preventing gray, conferring a cloak of invisibility on the wearer, activating all the chakras with their rainbow of colors, improving eyesight and possessing the evil eye, enhancing romance or symbolizing mourning, curing fevers and infections, and amplifying loyalty, hope, good fortune, personal virtue, and happiness. The conflicting fables and beliefs leave you free to select your own opal story and attach your own meaning to your stone. So you can rest assured that opal wedding rings aren't bad luck, but represent an open book for you to fill. Is it a myth in the making? Probably not. NASA first spotted opal-like deposits on Mars in 2008, leading scientists to propose that the silica strands indicate the Red Planet had a more extensive period of water-based life forms than originally hypothesized. A 2015 study of a Martian meteorite that landed in Egypt in 1911 revealed the presence of opal formations, confirming the NASA finding. As the Earth's supply of valuable opals is gradually mined to depletion, space exploration of a once life-supporting celestial body may refresh the mythology and the available inventory. In the future, the source for your fiery, almost-alive wedding ring could be yet another whirling planet set among the stars. There are many myths and an abundance of folklore surrounding opal rings, however, they remain a staple when it comes to beautiful rings. If you think this ring style is for you, create your own story and feel good about your upcoming engagement or wedding.